Courney Hines, who has cerebral palsy, will participate in the Alpha Group of Central Ohio’s new 1-mile walk on Saturday, Aug. 5. From left to right, Tamara Drayton of United Healthcare, Hines, Dr. Health E. Hound mascot, Liz Owens, chief executive officer of Alpha Group, Lexi Schneider, Amber Nelson of the Delaware Community Center YMCA, Mr. Waddle, Roger Bishop of Hyper Sounds Entertainment LLC, and Damon Renick of Red Hot Leads. • “Picnic with the Cops,” downtown Delaware, 6 to 9 p.m. Friday. Main Street Delaware’s First Friday will feature a police vehicle cruise-in, children’s policy academy training camp, obstacle course and refreshments. The sidewalk chalk art contest will take place. Pre-paid registration will still be honored. For information, visit www.mainstreetdelaware.com. • Ashley Corn Show, 102 E. Main St., Ashley, 5 to 11 p.m. Thursday through Saturday. American Legion Post 518 presents an event featuring food, live bands, mobile blood drive and carnival rides. Admission is free. • Harmony in the Parks, Bicentennial Park, Washington Street & Park Avenue, Delaware, 7 to 8 p.m. Sunday. Trombones Plus will perform in this summer concert series organized by the Delaware Community Center YMCA, 1121 S. Houk Road, which will host the concert in case of rain. Concert goers are encouraged to bring lawn chairs since seating is limited. • Big Summer Blowout, 2163 State Route 37 E., Delaware, 2 to 6 p.m. Saturday. New Beginnings Church of Delaware invites the commnity to join them for their summer event at their new location. The event will have food trucks, inflatables, live music, prizes and more. For information, visit www.delawarenewbeginnings.com. Courtney Hines said she’s a big fan of pop singer Taylor Swift. 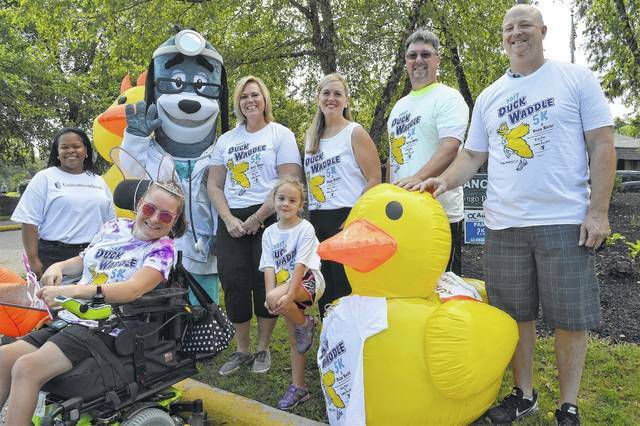 That’s why she named her team “Courtney Squad” for the Alpha Duck Waddle 5K’s new 1-mile walk at Mingo Park this Saturday. “All (Swift’s) friends are in a squad,” Hines said. Hines had at least eight people on her team as of mid-July, but encouraged more to join her by registering for the walk or to make a donation toward her goal of $600 for the Alpha Group of Central Ohio, the event organizers. Hines has worked as a receptionist for the Alpha Group for nearly three years. Hines, who has cerebral palsy, will participate in the 1-mile waddle in her wheelchair wearing an event T-shirt, tie-dyed in her favorite colors of pink and purple, with fairy wings and a tiara. Sheila Thomas, an Alpha Group spokeswoman, surprised her with the outfit one day. “Everyone at the office calls (her) princess,” she said. Hines hopes to be an inspiration for other people with disabilities by participating in the walk. “I hope I’m an example,” Hines said. This will be the third year for the Alpha Group’s 5K races. Winners will be recognized in the following categories: male, female, 12 and under, abilities, top three for the kids fun run, and top fundraiser. Registration for the 5K and 1-mile walk will open at 8 a.m. with the race to follow an hour later. Participants will receive race packets, which includes a duck t-shirt/tank, cinch backpack, Mingo Pool pass, one duck race entry, and a voucher for a free doughnut. The new mile walk was designed to give “people with wheelchairs, strollers an opportunity to participate,” said Craig Conroy, board chairman of the Alpha Group. In general, he said the event helps Alpha continue its mission to connect people with disabilities with work in the community. “It’s a family day opportunity for the kids and family,” he added. There will be a Kids Fest that will include a bounce house, games and live music. In addition, duck races will begin at 10:30 a.m. There will be four rounds in which participants will race their ducks on the Olentangy River. The winner of each round will then compete for the grand prize. Proceeds from the event fully benefit the Alpha Group. For information or to help raise funds, visit www.alphagroup.net.